Source: Monument to the "Confederate Grays," 20th Regt. NC State Troops, Co. E. Image courtesy of the North Carolina Department of Cultural Resources. Photograph by Tom Vincent. Standing ten feet tall, this granite monument honors the memory of Company E, the 20th Regiment of the North Carolina Confederate troops. The monument bears 107 names of the original roster of soldiers who fought within the regiment from Faison, NC. In addition, a small wreath is inscribed on the front of the monument's uppermost point. This wreath has the name of the troop inscribed in its center. Surrounding the central marker are four, small concrete pedestals adorned with concrete balls. These create a border of sorts around the marker, itself. 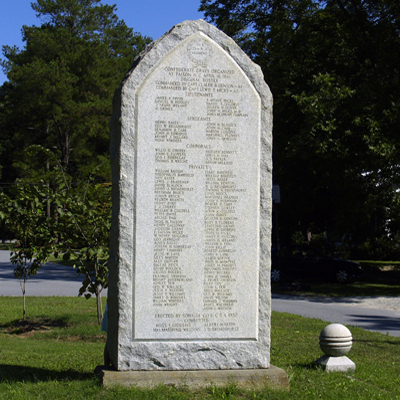 The dedication of this monument occurred on May 20, 1932 in Faison, North Carolina. Wilmington attorney J. O. Carr was chosen for the address at the monument's dedication. During his speech , Mr. Carr discussed Company E's history in the town of Faison. Mrs. Marshall L. Williams presided over the ceremony and the high school band played during the dedication. E. G. Broadhurst presented the monument to the town of Faison. It was accepted, on behalf of the town, by Mayor E. G. Faison. Other speakers at the ceremony include W. H. Sprunt of Wilmington, North Carolina. The same Confederate flag which had been used to cover North Carolina's Gettysburg monument at its dedication in 1929 was also used in this ceremony. The 20th North Carolina Regiment, Company E, was enlisted at Smithville (now known as Southport) on April 16, 1861. The Confederate Grays were infantry soldiers and the 20th Regiment elected C. B. Denson as their Captain. The company was trained at the Franklin Institute and was sent to active duty in Smithville (Southport), North Carolina. Out of the original roster of 107 members, 26 were killed or died of wounds. This monument is located north of W. Main Street and is situated between two sides of N. Faison Avenue (due to a split in the road) in Faison, North Carolina. The front of the monument faces south. This monument is located in an area of grass between the two portions of Faison Avenue. Although both roads are lined with historic homes, the area where the monument stands contains no homes or other buildings.